A lazy day lying in the sand. Diving into the white caps. Long walks. Playing a game of beach volleyball. The sun setting over Lake Michigan. Come on, this is what you wait all year for. Rarely crowded, this expansive sandy beach offers amenities like grills, playground and concession stand, volleyball and tennis courts and a fenced-in dog park where the family pet can frolic freely. From here, stroll Manistee’s Riverwalk, a boardwalk that stretches along the Manistee River through downtown. Shop and dine, but be sure to get back to the beach in time for sunset. Located at the west end of First Street, on Lake Michigan. This public beach is one of the best in-town beaches you’ll find anywhere. 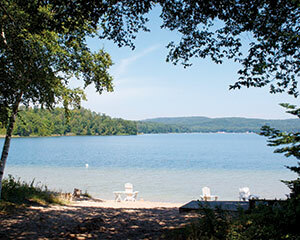 A perfect swimming lake, Crystal Lake offers a clear sand bottom, and the beach has a clearly marked swimming area. The beach is just a block from downtown Beulah, and family-friendly Beulah Park’s pavilion, picnic tables, grills, tennis courts and a beach house—all in the shade of majestic maple, oak and birch trees. Carve out your spot early for the annual July 4th fireworks. On Lake Street north of Commercial Ave. Stunning beaches can be found at intermittent road-ends along the 35 miles of Lake Michigan shoreline within the Sleeping Bear Dunes National Lakeshore. Try two local favorites, where Platte River and Otter Creek meet Lake Michigan, popular for their warm shallows. There’s just something wilder about the waves on this stretch of beach cut off from Frankfort by Betsie Lake and a gigantic ridge, making it a favored destination for body surfers and wave jumpers. The shelter of the towering bluffs lends a sense of privacy, save for the occasional hang glider soaring above. This beach-going favorite features a view of majestic coastal dunes to the north and a long pier perfect for a romantic stroll toward the Breakwater Lighthouse. Or just sit in one of the beach chair swings and watch the kiteboarders who come to catch the breeze. Walk to the cute downtown. The iconic and much-photographed Betsie Lighthouse graces this sanctuary, located 4 miles north of Frankfort. Pointe Betsie forms the southern entry point of the Manitou Passage, the legendary shipping channel between the Manitou Islands and the mainland. Enjoy beach picnics, sunsets and searching for Petoskey stones. 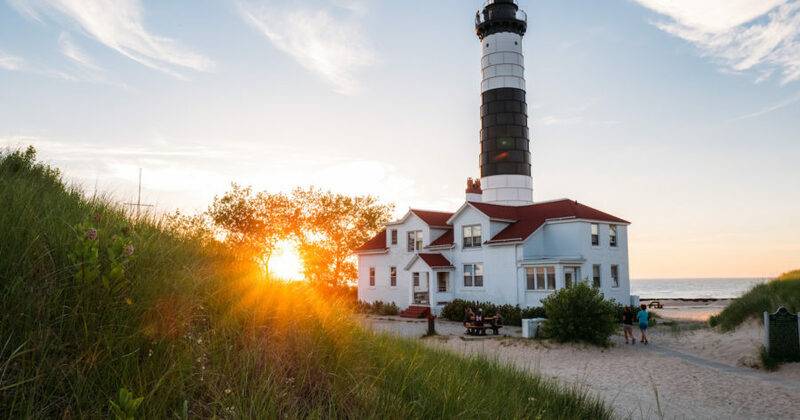 The sugary sands stretch for nearly seven miles at Ludington State Park, which encompasses 5,300 acres of scenic dunes, beaches, cool, dense forests, and marshes teeming with wildlife. Bonus: The park will be adding a second floor veranda to its public beach house—certain to be a choice spot for sitting, reading, or day-dreaming as you gaze at Lake Michigan’s clear blue waters and listen to waves lapping at the shore. 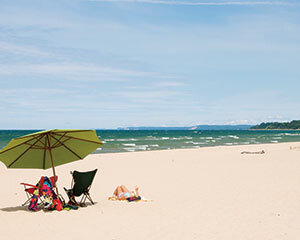 Find more summer vacation ideas in Northern Michigan in MyNorth’s free Vacation Guides: Traverse City, Petoskey, Benzie and more!